The NZXT Phantom 820 is a full tower case, the newest of their Crafted series. It seems to combine the lessons they learned from the original Phantom, along with what they learned from the Switch 810. 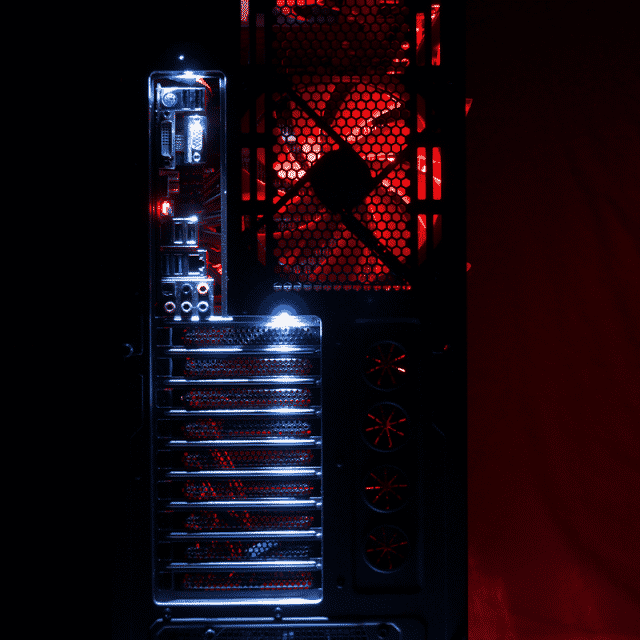 NZXT threw in their recently released HUE color LED controller, and then made this beast compatible with their new Kraken series of All-In-One liquid coolers and radiators in general. All this combined, you have the makings of a case designed to appeal to high-end enthusiasts. But will it stand up to detailed scrutiny? Let’s find out. 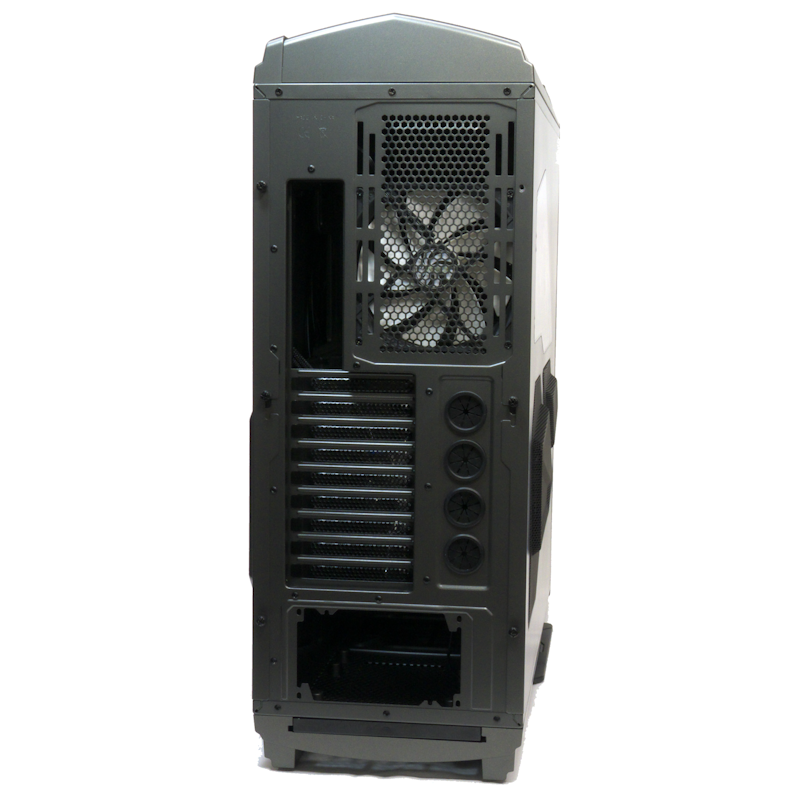 The Phantom 820 is engineered to chill even the most demanding systems, equipped with triple 200 mm and a 140 mm fans. Maximize the potential by mounting up to nine fans to achieve unrivalled airflow in your chassis. 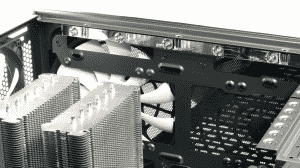 Push the envelope and utilize liquid cooling systems that feature a push-pull configuration with top 280/360 mm and bottom 240/280 mm radiators up to 60 mm thickness for unmatched performance. 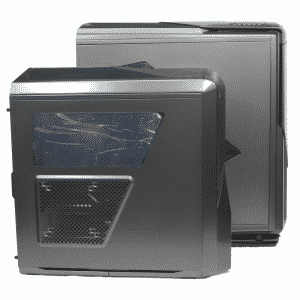 In addition, a rugged base design lifts the enclosure above the ground for display and increased airflow. The Phantom is reinvented again by following it’s legacy of remarkable asymmetrical and award winning design. 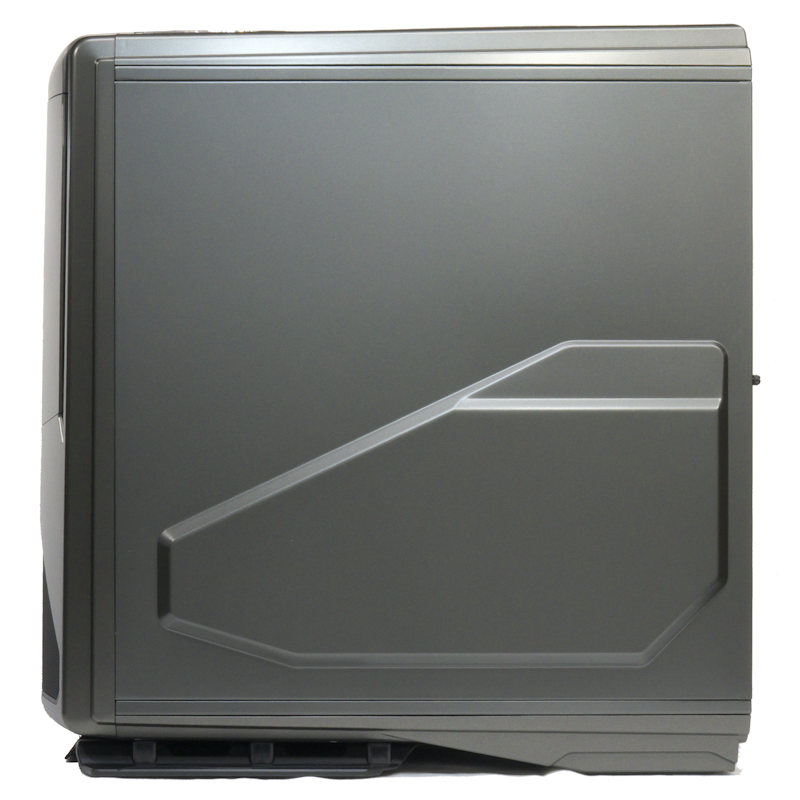 So now you know what NZXT wanted to accomplish with this new case. Yup. It’s big all right. It seems like the case size was doubled when the model number was doubled. 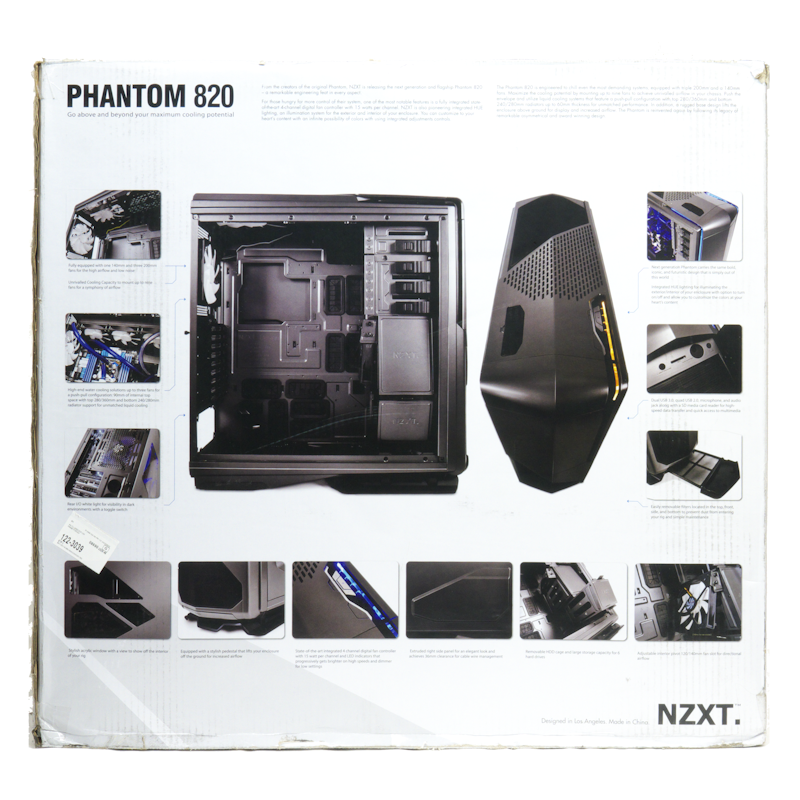 The NZXT Phantom is available in White, Gunmetal and Black. The Gunmetal case reviewed here was provided by NZXT. Thank you! The box holding the Phantom 820 is huge: 29 x 27 x 12 inches, or 74 x 69 x 31 cm. It has your standard front oblique view on the front of the box, so I reciprocated by showing the box in a front oblique view. The back has photographs showing off a number of features. The pictures are clear, and in full color. Inside the carton we begin to see more than the standard contents. Aside from the normal Styrofoam caps and plastic bag, there is a foam panel that covers the front of the case. 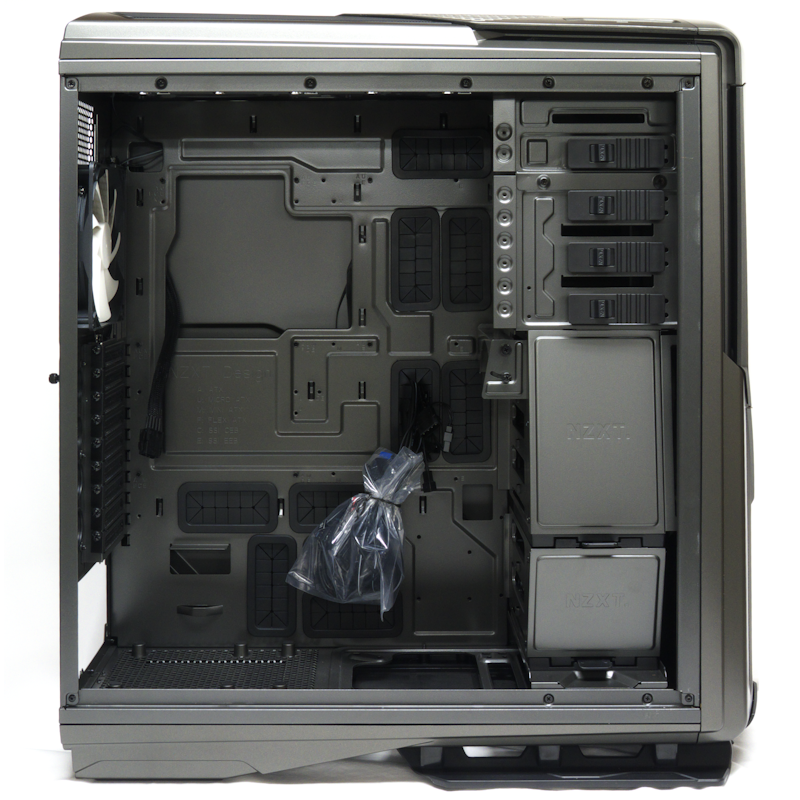 Embedded in the panel is a plastic box that contains the case accessories. 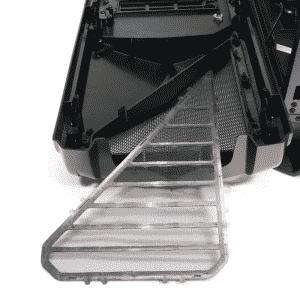 It is taped shut to prevent spillage, and it includes a 3×4-inch (7.5×10 cm) users manual. Lucky for us that manual is also on line in a nicely-expandable PDF. The online version is perfectly readable. Be careful. The unloaded case is tipsy. It feels top-heavy, though it really is not. With such a tall case on such a narrow base, it can get out of control very quickly; keep a good grip on it. 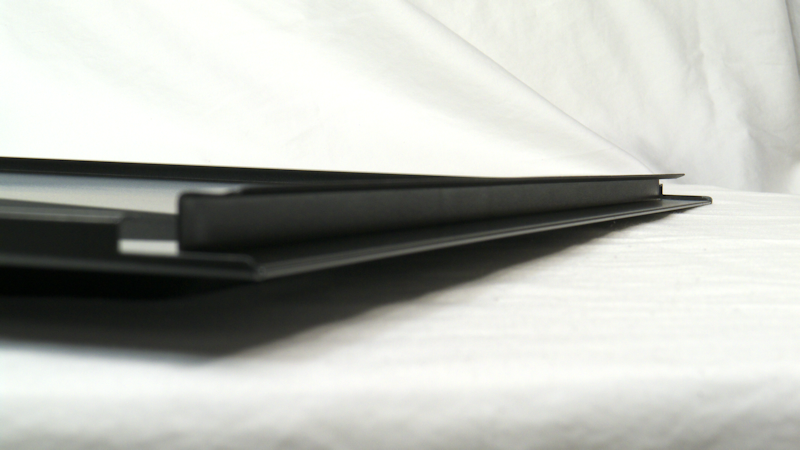 Starting with the front, we see the angle motif of the Phantom series (for a comparison with the Phantom 410, see my review of that case here). 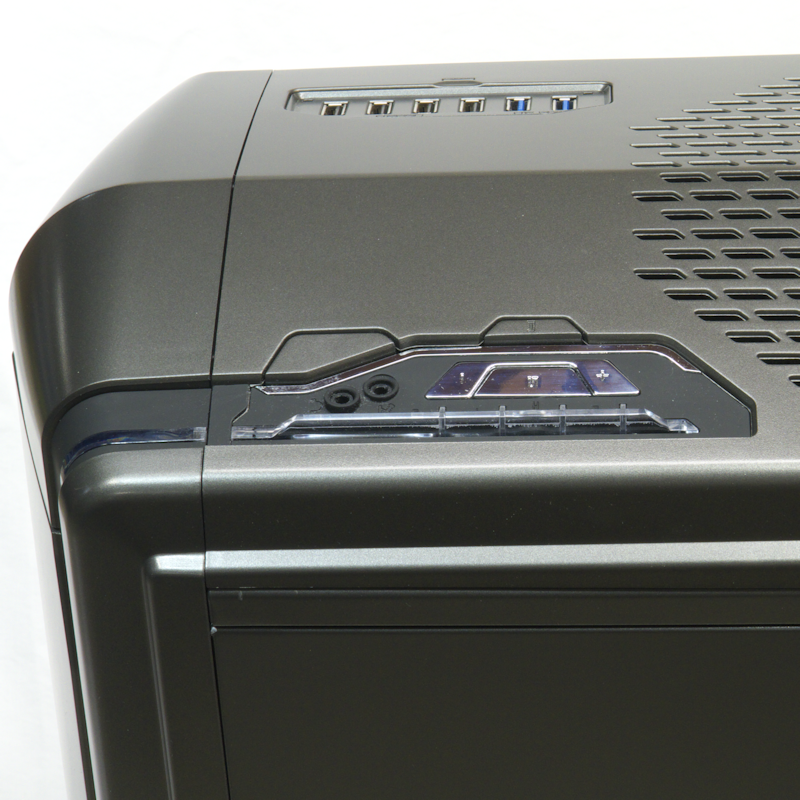 We can also see the front 200 mm fan peeking through a tight front grill. On the side, more angle motif, a plastic-protected Plexiglas window and another 200 mm fan. From the rear we see nine expansion slots and four grommets for external radiator tubing. That exhaust fan is 140 mm. 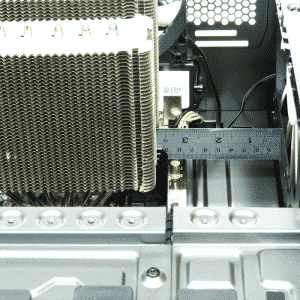 Not only can it slide up and down to accommodate whatever cooling you have in mind, the fact that it is 140 mm says the main chamber is wide enough to fit a 170 mm tall heatsink. 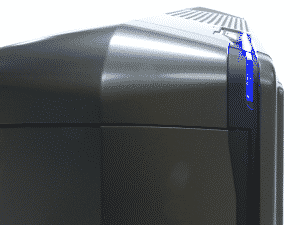 It will also move more air more quietly than a 120 mm exhaust fan. Note the broad dimple on the right side panel. 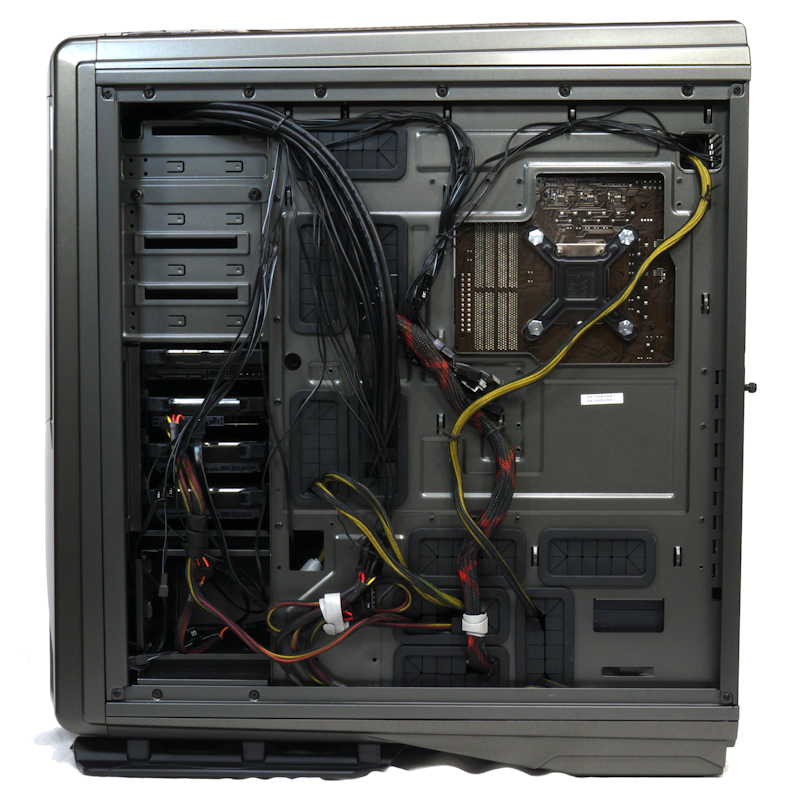 While it does not replicate the left panel, it provides lots of extra space for cables. NZXT says there is 36 mm here. The top of the NZXT Phantom 820 has their fan control unit on the front left. Complete instructions for using it are in the manual; well worth reading. The microphone and headphone jacks are here. 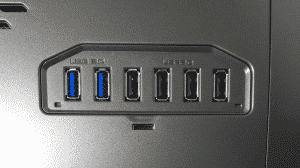 On the front right are six USB ports, two USB3 and four USB2. You can see the third 200 mm fan that comes with this case. 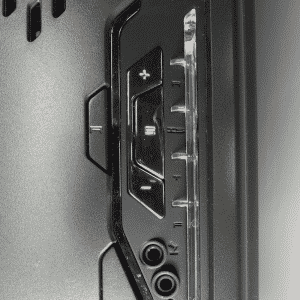 In a closeup of the fan control panel, we see letters that can be read from the front of the case: R for Rear fans, IS for Inside and Side fans, T for Top fans, F for Front fans. 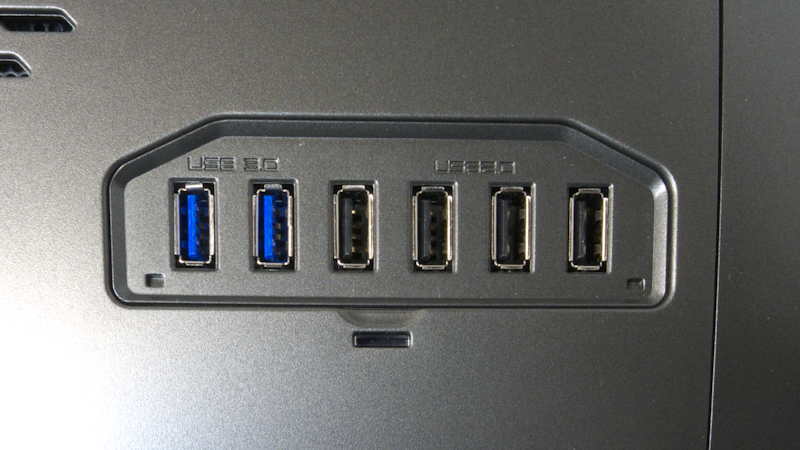 The next picture is a closeup of the USB panel’s two blue USB3 ports and four USB2 ports. 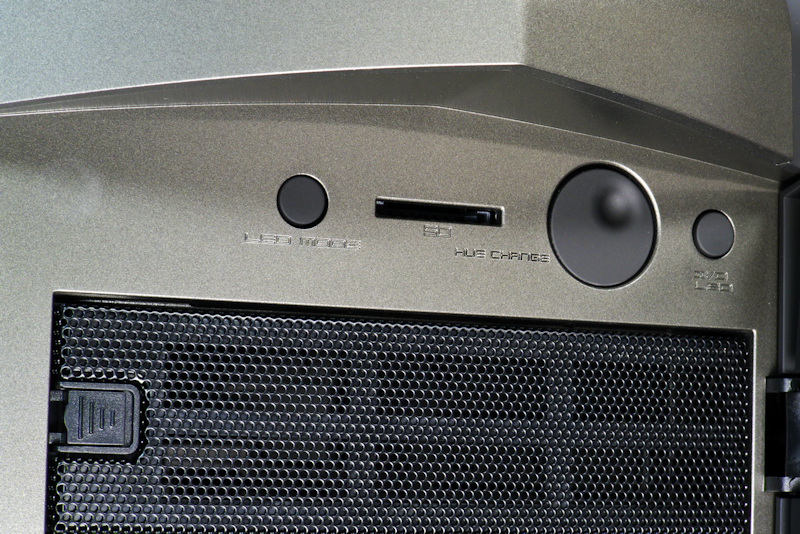 The bottom of the Phantom 820 has a relatively open grill for a bottom mount power supply’s air intake. The overlying filter has a fine mesh screen with rectangular reinforcements. Forward of the PSU space, there is no grill though there is a filter with the same fine mesh. 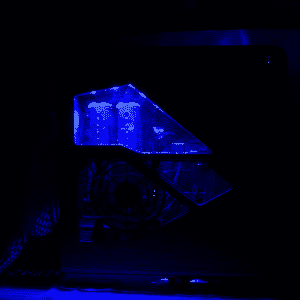 NZXT wants air to flow freely here. 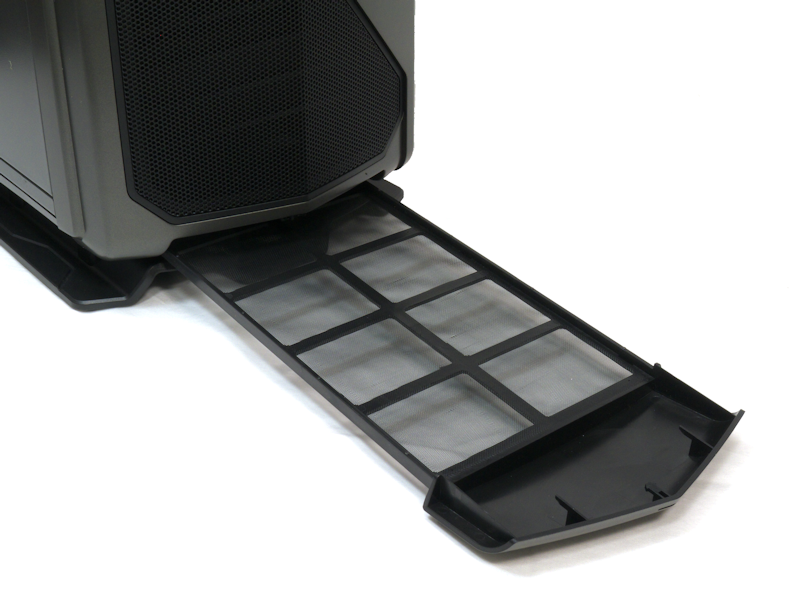 Having an open space for the bottom instead of a grill is another unique feature for this case. The bottom quarter view of the Phantom 820 shows how the rear most filter pops out. You simply push it forward slightly, and it springs out the back for easy cleaning. You can also see the sturdy feet, which this case surely needs. The one problem I foresee is having to move the case around to get at that back filter. Say A-a-a-a-h! That forward bottom filter (same fine mesh) also pops out when you press on it. Then you can pull out the filter for the forward two-thirds of the case. It’s a great idea for cleaning the bottom filter. 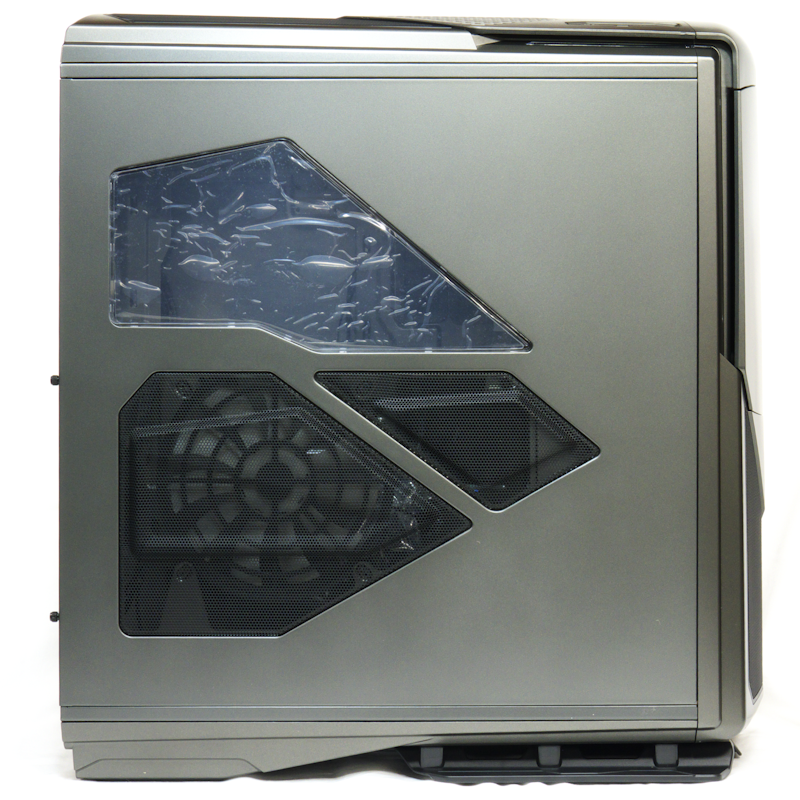 I have just one question: since this case will enclose a system heavy enough that one will not want to move it, why not have the whole bottom filter made as one piece and slide out from the front? Then you wouldn’t have to move the case to clean your bottom filter. The front door, when opened, reveals HUE controls (more about those later). But see that slot up there? That’s for an SD card reader. This is an extremely convenient facility to have in your case. In the 5.25-inch bay, we have steel mesh slot covers with easy-pull latches. But given these are behind a door, why bother with mesh? Let’s pop the faceplate off this case. In the 5.25-inch bay we see a shelf for a device. If we can remove that shelf will we have room for a 140 mm fan in the bay? That would actually make those mesh slot covers useful. Below that is our first 200 mm fan. Where is the filter? The filter is the familiar fine mesh, clipped into the faceplate. 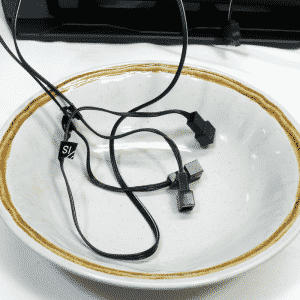 It requires some fussing to remove and clean it, but no tools are needed. 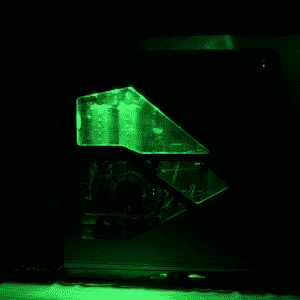 In the next picture we focus on the two latches at the rear of the Phantom 820. Loosen either screw slightly, pull down and push the back of the panel outward slightly. Then pull straight back and the panel is free. This is surprisingly convenient, but . . .
. . . the best thing about the arrangement is that each side panel sits on a shelf that supports its weight. This makes it possible to change your grip from the back screws to holding the panel with both hands. These are heavy panels, and they will fall from your grasp if you don’t keep a good grip on them. 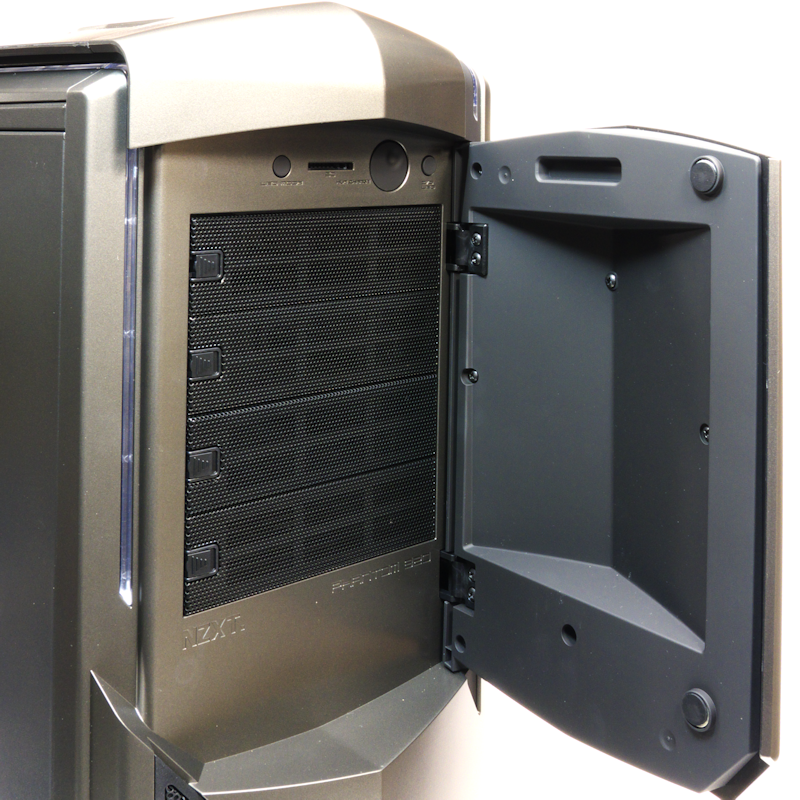 The right picture shows how the panel engages with the front of the case. Simple and effective. Flip off the side panel and the 200 mm fan is clearly visible. Also clearly visible is a lot of uncovered mesh. All that mesh lets air through, and it means that you will not be building a positive or negative pressure system in this case. You may have airflow, but no pressure. That’s actually a good thing: negative pressure leads to internal dust buildup, and positive pressure leads to hot spots inside your case. NZXT keeps you from making either mistake. What you can’t see is the filter for the 200 mm fan. You have to unscrew the fan to clean the filter, which is the Phantom’s fine screen. And no, the outer mesh is not a dust filter. Inside the main chamber, we will go clockwise from the bottom PSU opening. 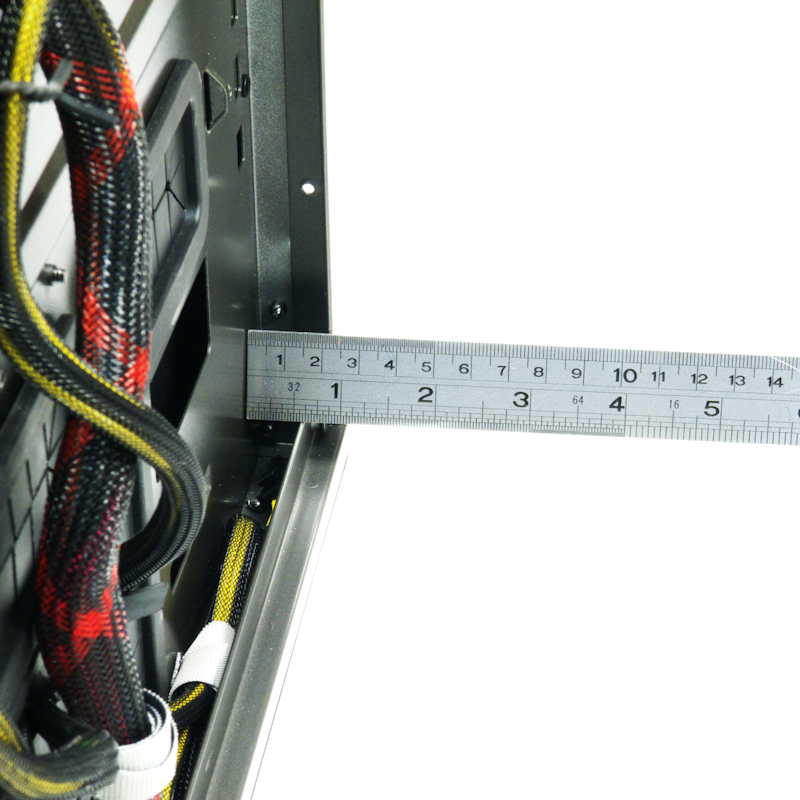 We see nine expansion slot covers held by thumbscrews, a 140 mm fan, and the EPS12V extension cable. In this case, the EPS12V extension cable is included to extend the reach of your PSU cable. Unlike some cases, the EPS12V opening has lots of room for the EPS12V plug. The CPU window is as large as it can be while accommodating the screw positions of all the different motherboard sizes this case supports. Then we see ten grommets and twelve pass-through ports (counting the EPS12V opening). The ten ports with grommets have knurled edges, so you don’t really need those grommets. On the other hand the grommets are not easy to dislodge, making it convenient to leave them in place. 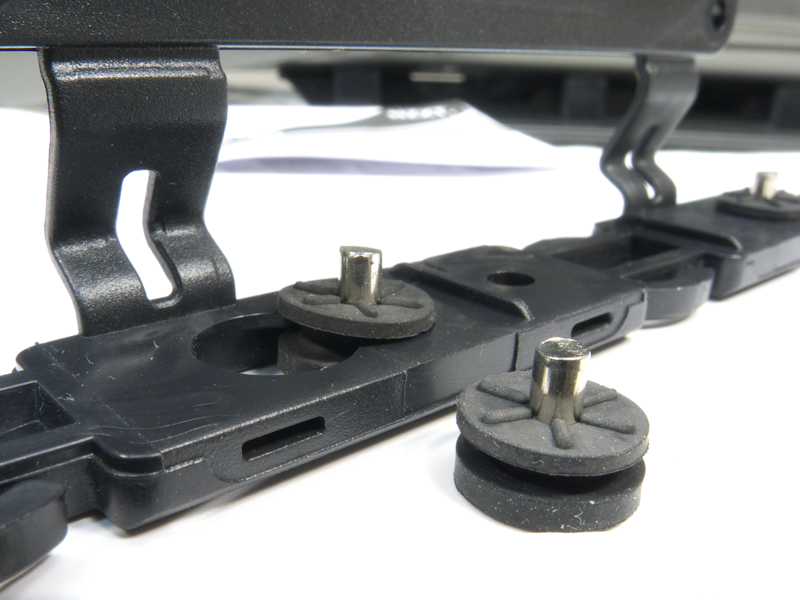 Next to the main chamber there are tool-free 5.25-inch device clips. Below that, the hard drive cages are covered on this side. The lower cage has tabs on top and on the bottom. Squeeze them and pull outward to easily remove the lower cage. To the left of that, a bag of case cables. In the below left picture, we can see the NZXT instructions on where to place the standoffs for six different motherboard form factors. The standoffs for ATX motherboards are already in place. 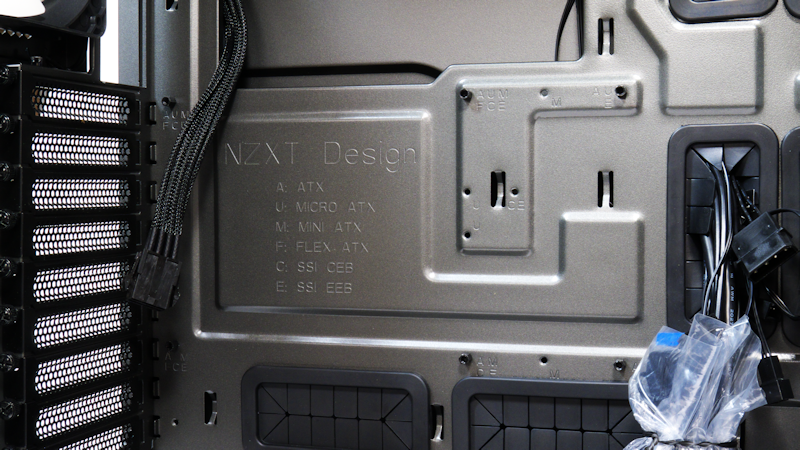 The presence of tie-down points for the back of the motherboard tray can be seen here too. In the right picture we demonstrate room for a 36 cm graphics card. On the left we see there is a grill for the PSU, and no grill for the adjacent fan. On the right, we see there are six pads that accommodate power supply units as short as 140 mm, and longer than 180 mm. 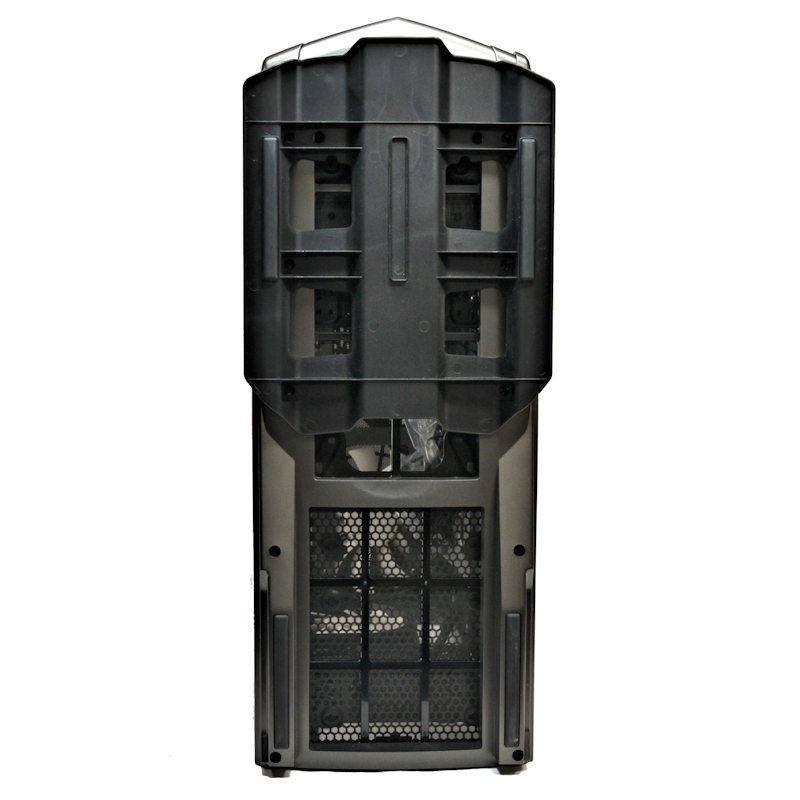 When you pull out the lower hard drive cage you see a shoe. The shoe is fastened with machine screws and is simple to remove. Under the shoe is room for another fan. 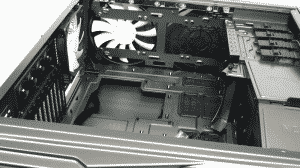 Or together the space can be used for a 240 mm or 280 mm radiator and its fans. Looking up inside the main space, we first of all see there is no grill. With mesh on the top cap there is no need for a grill there, and NZXT should be applauded for leaving the space relatively empty. 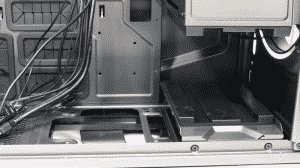 Inspecting the screw hole placement, we see positions for two 200 mm fans, two 140 mm fans, and three 120 mm fans. 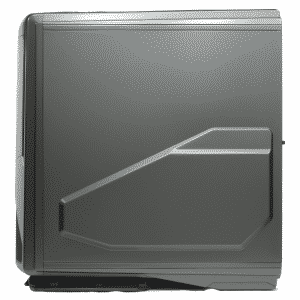 NZXT has also set up this space for 240 mm, 280 mm or 360 mm radiators. As a reminder, we will again look at the top view of the case cap. Now let’s pop it off. There is the third 200 mm fan with a filter on it. Above it is the space for another 200 mm fan. Covering that empty space is a 200 mm fan filter. How considerate! 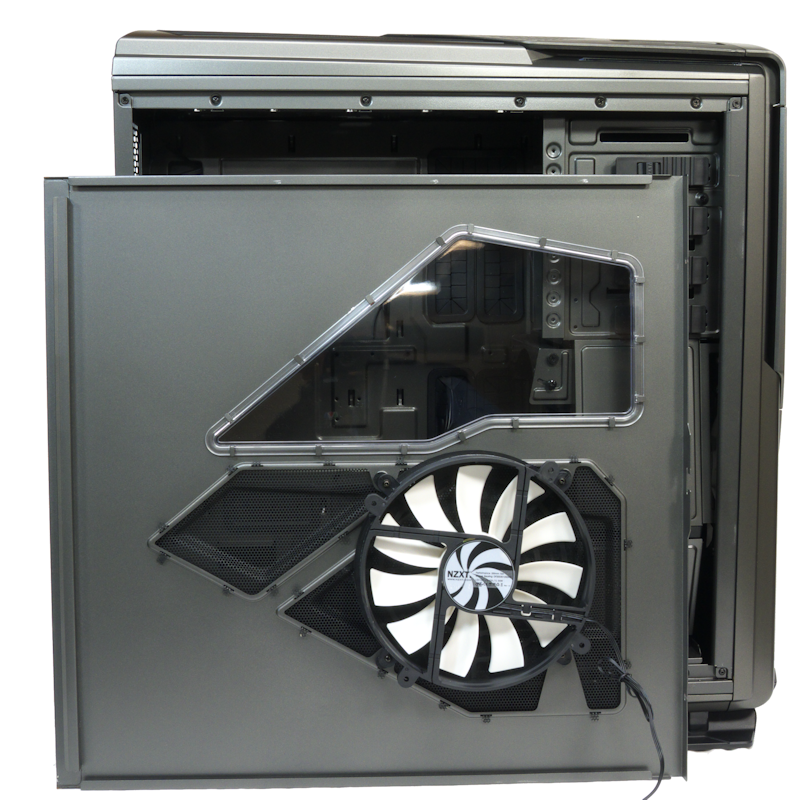 Having filters for two 200 mm fans on top means you can do air intake from the top of this case. 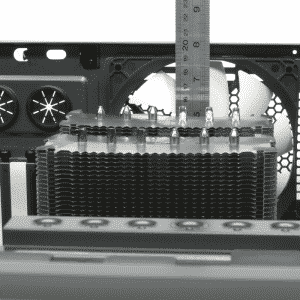 Many of us airheads want to give our heatsinks the coolest air possible. That is best doable from the top of the case. 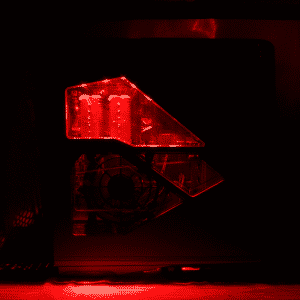 NZXT seems to recognize the possibility, and goes with it. Bravo NZXT! Before we start a system build in the Phantom 820, let’s look at that 5.25-inch bay. If we can get that shelf out of there, we can put our DVD in the lowest slot and devote the upper three slots to a fan. 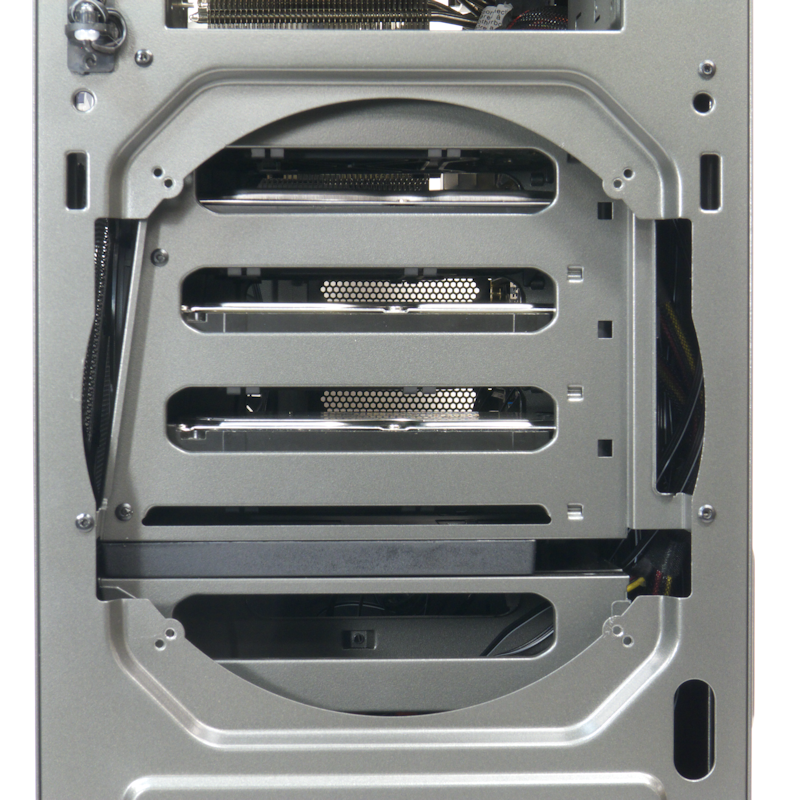 A 140 mm fan takes up three slots and more, but if the top of the bay is open you can put a 140 mm fan in there. Alas, the top slot is just two sidewalls. 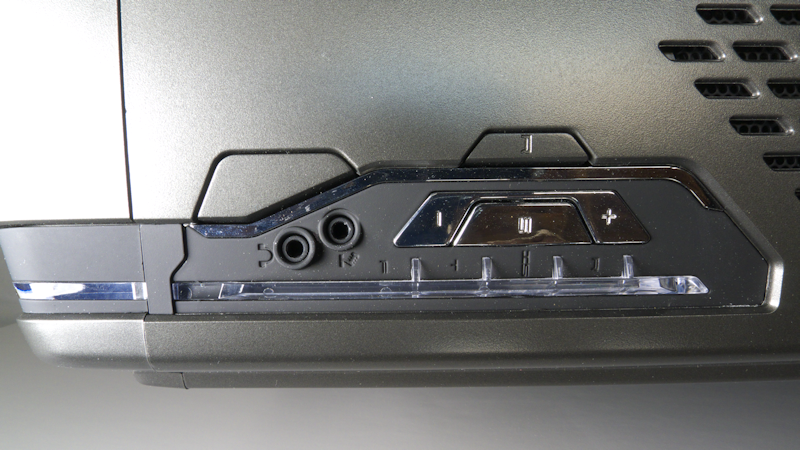 The bottom of the slot is the top of a three-slot bay. You can put a DVD drive up there, but not a fan. As you can see, the largest fan that will fit in the bay is 120 mm. 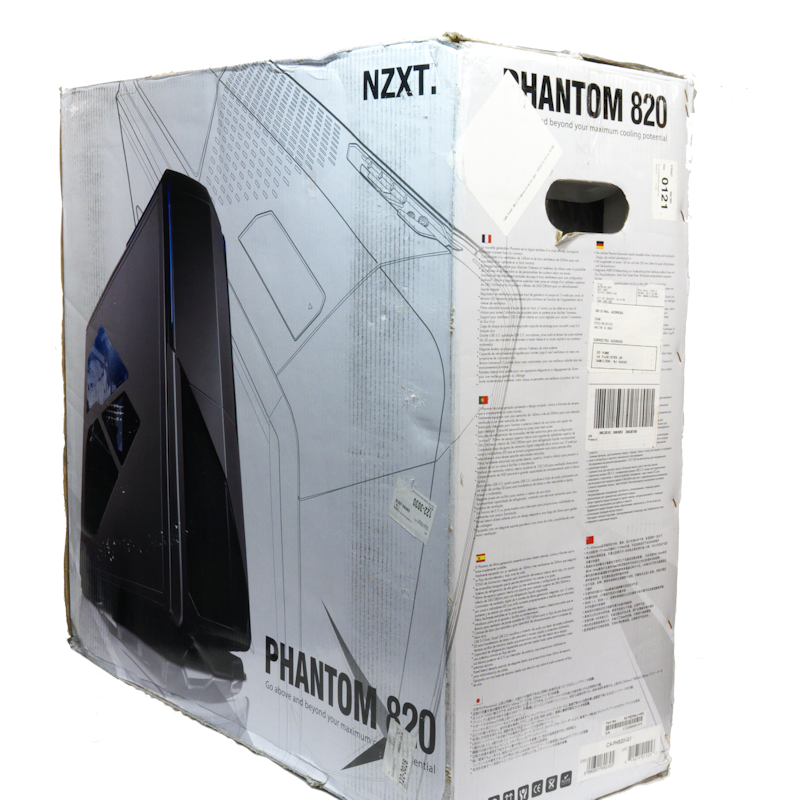 Are we ready to build a computer system in the NZXT Phantom 820? We need to look at a few more things. 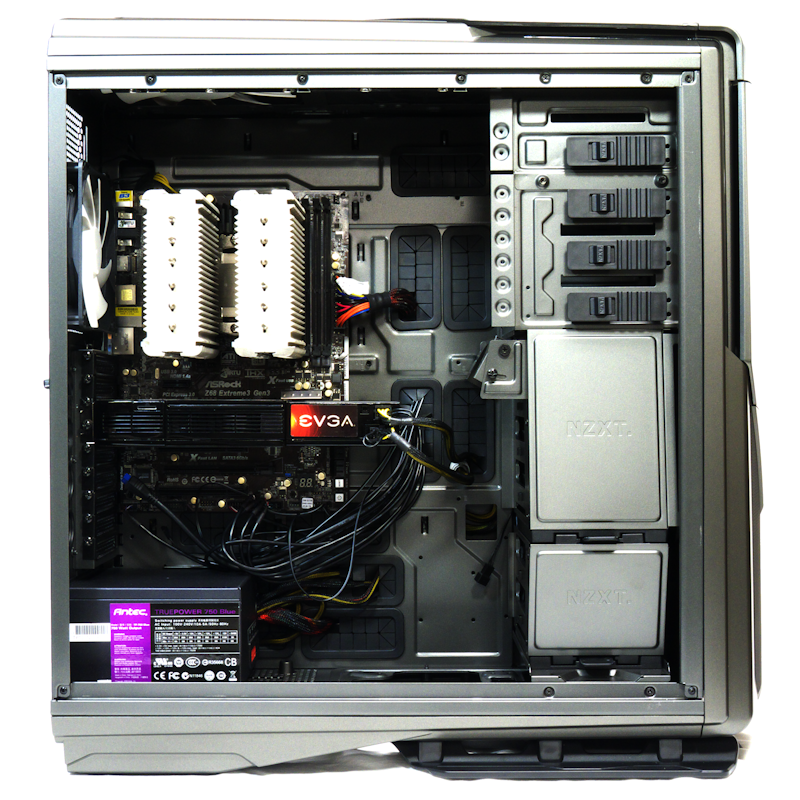 First, the case cables that plug into the motherboard. You can see that we have a single USB 2.0 plug, a pair of dual USB 2.0 plugs, and a dual USB 3.0 plug. 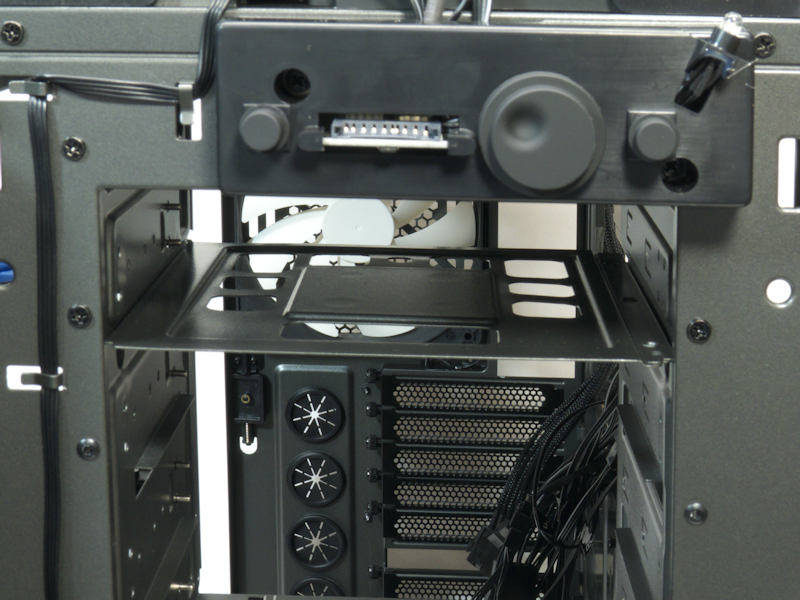 All of those cables match up to our SD card reader in the front of the case and our USB panel on the top of the case. The HD Audio cable is thankfully unaccompanied by an AC ’97 plug. 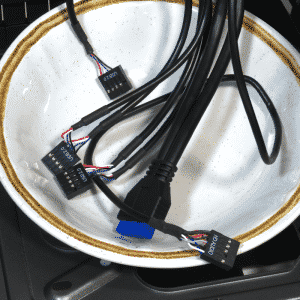 No excess wiring here. In the right picture, we see the three fan sockets labeled “IS”. These control the inside and side fans, or fans you wish to gang with your “IS” fans. These are your longest fan wires. Measuring from the top of the case (where the wires emerge), two of the IS wires are 27 inches (700 mm), and the other one is 36 inches (900 mm). Since the left side panel fan wire has enough slack to extend six inches beyond the back of the motherboard tray, you can take the side panel nearly three feet from the case while leaving the fan attached. 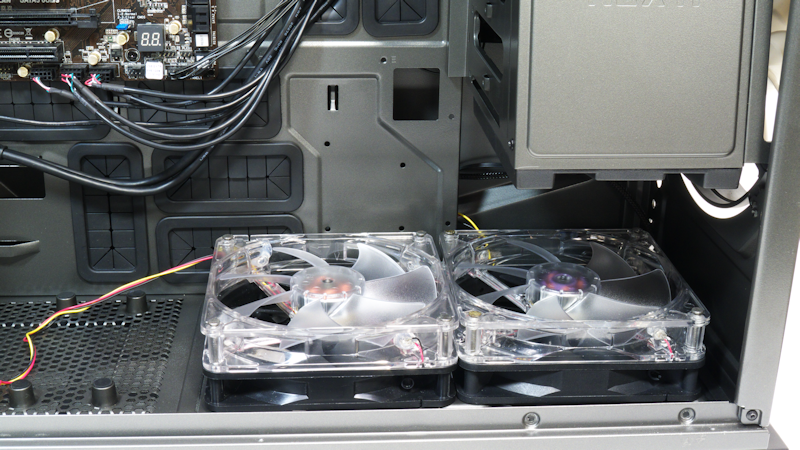 The Phantom also provides you with sockets for three “R” fans, three “T” fans and three “F” fans; twelve in total. 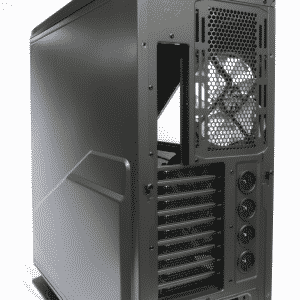 The case will fit at most, eight fans. With the overcapacity on the four control lanes you will have great flexibility in deciding which fans to control together. Not only do we have an accessories box, we also have a stick-on label guide to the contents. That and the fact the contents are reversed, tells us NZXT wants the label on the bottom of the box. A nice inclusion is the standoff wrench. It is really helpful when you want to uninstall or install a standoff. OK, let’s build. Install the motherboard and the PSU. Plug in cables and wires. Install the graphics card and the CPU heatsink. Oh my. This is so very easy. No show-stoppers yet. Let’s turn this thing around and look at the back. Plenty of tie-down points to manage cables. 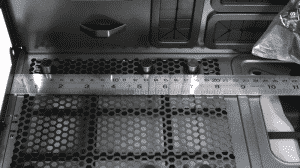 The motherboard tray CPU window is plenty big enough for mounting backplates of heatsinks. Because the side panel is bulged out, there is lots of room for cable management. So far, only one glitch, which we’ll get to. 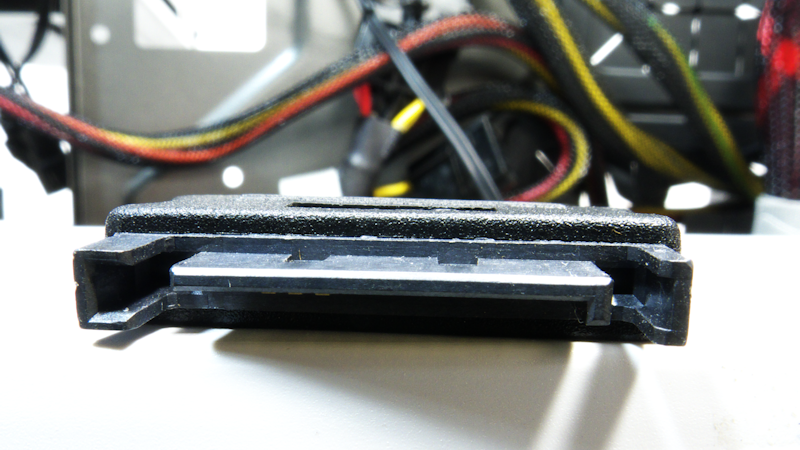 Here is part of the reason we have so little trouble; there is more than 2 cm of room behind the motherboard tray. Add the bulged out right panel, and you have very generous cable space. Here is our problem child. The problem does not come from the gripping handles and the hard drive cabling being on the same end. The problem comes from the rivets extending through the rubber grommets that fit into the screw holes of the hard drives. These rivets precisely fit into those holes, and they’re a pain to get right. They could use a bit of a taper. They pop the grommets out of the HD trays so easily. Very annoying. 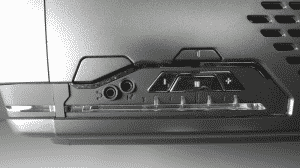 Similar HD trays caused the same problem with the Phantom 410. 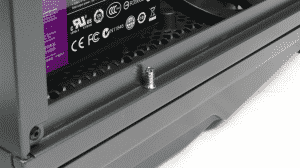 NZXT has had time to make this easier for users, but they have not. Now would certainly be the right time to fix it. 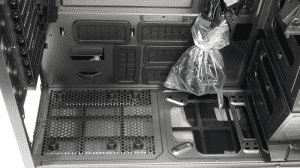 But one positive aspect we should note is the bottoms of the trays are wide open to facilitate cooling. 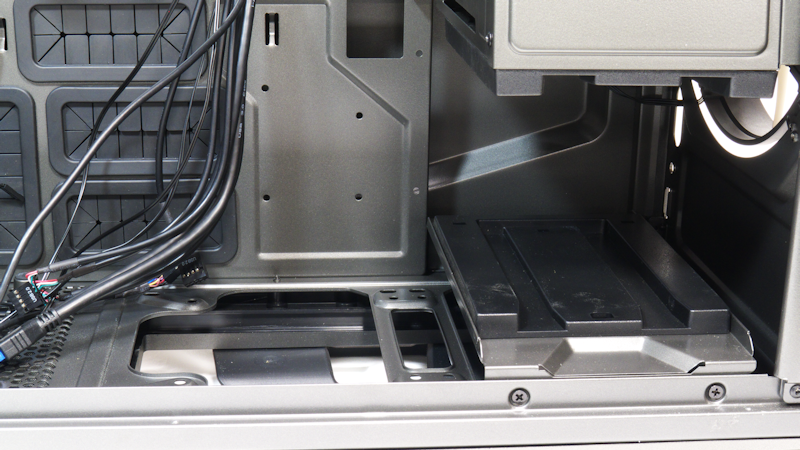 Now that we have fussed our hard drives reluctantly into their trays, we can apply a few finishing touches. For example, let’s try out the “adjustable interior pivot 120/140 mm fan slot for directional airflow.” Looks cute in both positions (flick between the two pictures to get a crude animation effect). 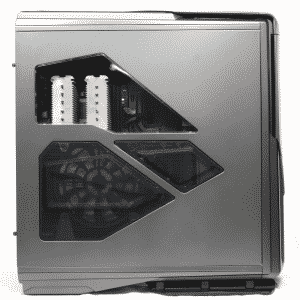 NZXT tells us we can put a 120 mm or 140 mm rad in there too. 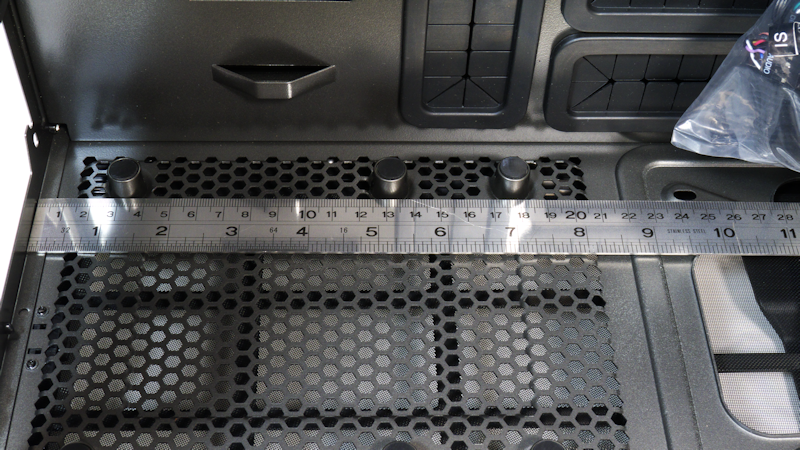 The main cavity gives us 20 cm distance from the motherboard to the closest edge of the side panel. That’s more than enough for the tallest heatsink. 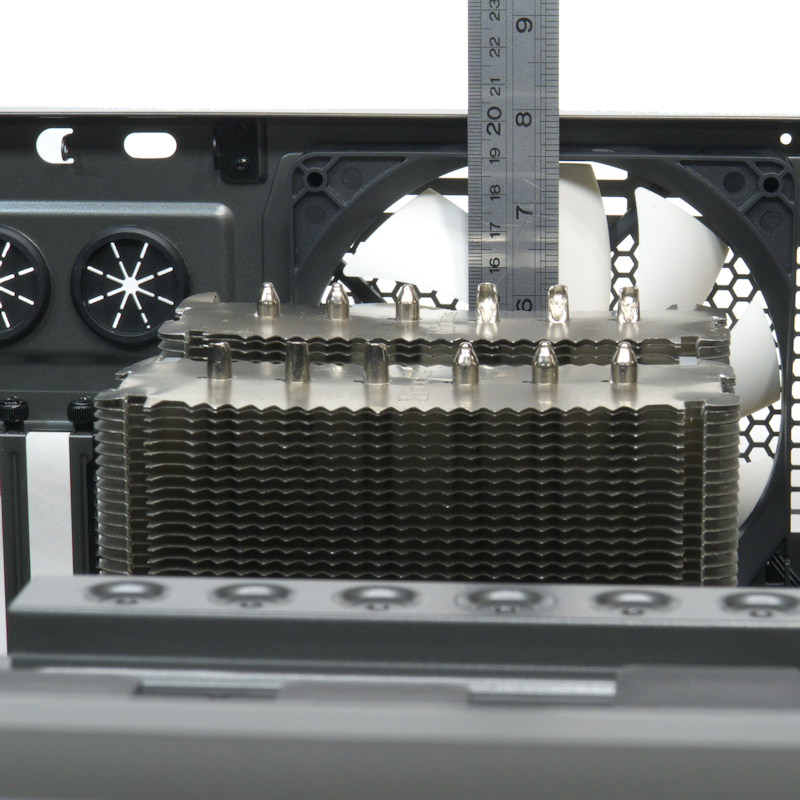 At the top of the main cavity, we see nearly 75 mm of radiator space. 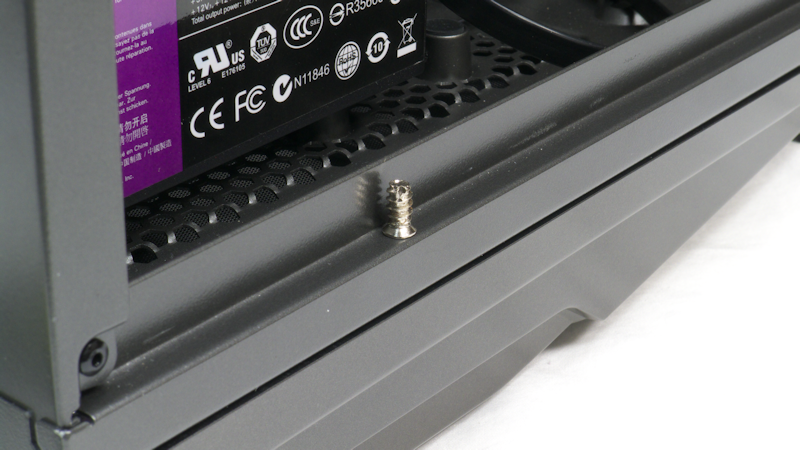 NZXT advertises 90 mm, so they must discount the top of the main cavity to 65 mm (to give the EPS12V cable room to get through), and add the 25 mm fan space on top of the case, under the top cap. 65 mm+25 mm=90 mm. So, the space is there. Hmm. 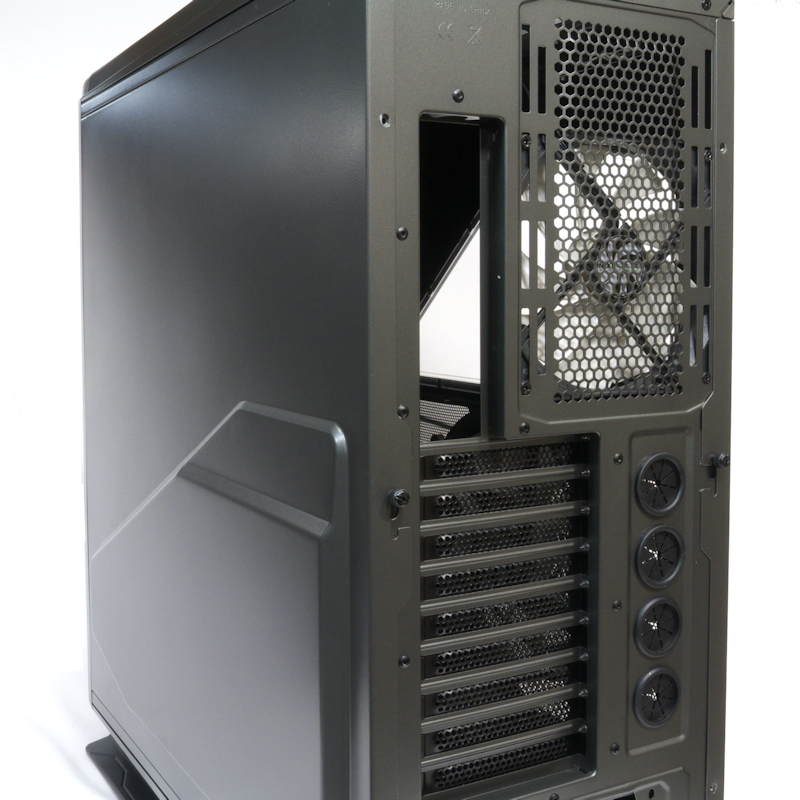 The case is made to fit a 360 mm radiator. 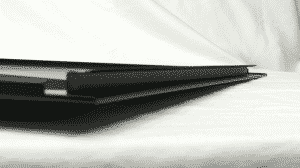 Some of those radiators get mighty thick, and waterheads often enjoy pushing air through with 120×38 mm fans. 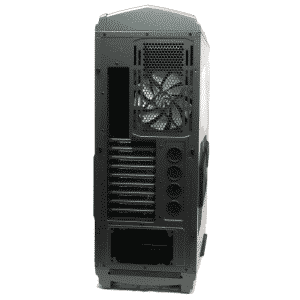 So, what would happen if we let a 360 mm radiator hang down from the top, and put in three 120×38 mm fans? I tried it. 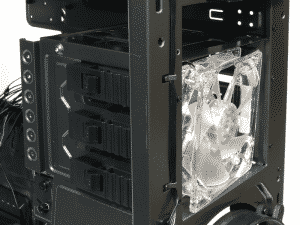 With three 120×38 mm fans on the top of the case, the cap had to be firmly pressed down. A couple of extended bolts pressed onto the forward-most fan’s frame, but it did fit. So you can use a 360 mm radiator under the top with three 120×38 mm fans on top. You waterheads take note. Before we button up the case, we need to look at a few more things. 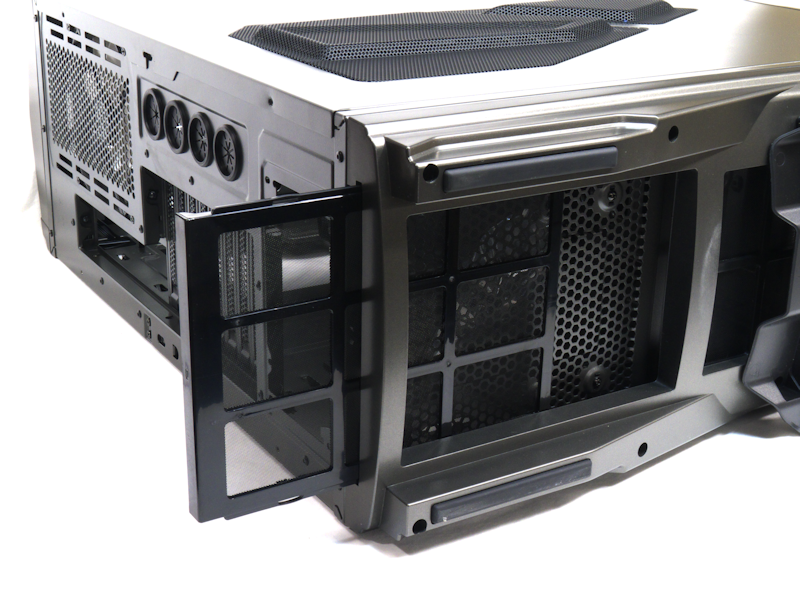 First, we will look at how well a 280 mm radiator will fit on the bottom of the case. The left picture is a repeat of what we have already seen when the lower HD cage is removed. If we then take out the shoe, we can put in its place a 280 mm radiator with its fans. Well, this is obviously not a radiator and its fans, but in the right picture you are looking at two black 140 mm fans pretending to be a 280 mm radiator. With two clear frame 140 mm fans on top, you can get an idea of the available clearance. 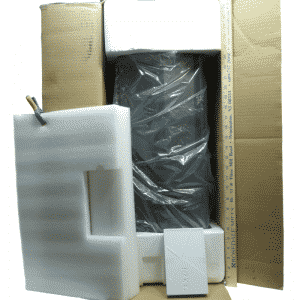 It is clear from the picture that there is room for a thicker radiator, or even shrouds. Note that even if you put a 180 mm PSU in your case, you have room for a 280 mm radiator. One nice thing to note is with the PSU installed in the bottom, the case is no longer top-heavy. The next subject is cooling our hard drives. As you can see, there is open space for air to get through, and with the trays being as open as they are, we should have decent cooling. But we will test this hypothesis after we have closed up the case. Stay tuned. 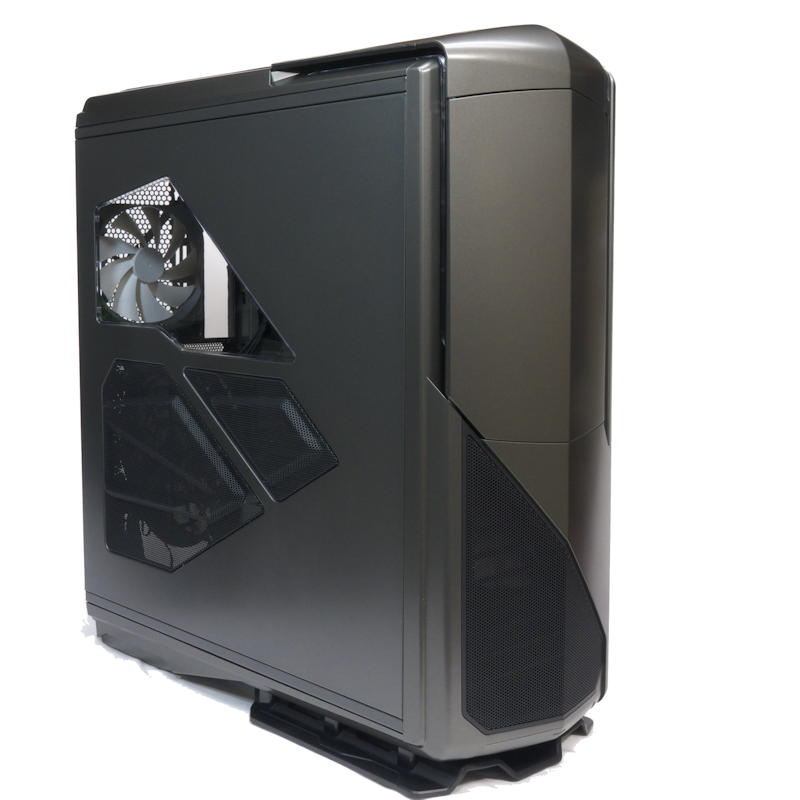 NZXT has included a version of the HUE with this case. In the left picture, we see the top row of LED recesses. Each recess has three LED’s: red, green, and blue. We will cover the external controls once we have closed up our build. 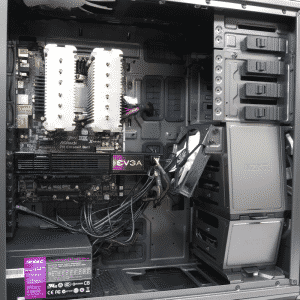 In the second picture we see the wave of the future; the HUE gets its power not from a Molex connector, but from a SATA connector instead. Here we have our system, all buttoned up. Handsome devil, yes? Let’s turn to the fan controls. They are located at the right front of the top of the case. You read them by looking down from the front of the case, as the second picture shows. 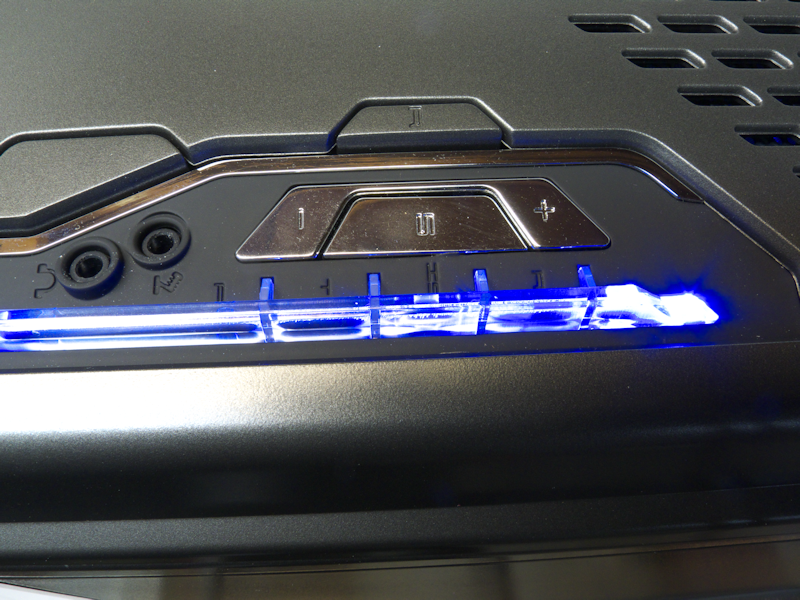 Reading from left to right, we see the reset button and a cluster containing the (+) increase fan speed button, the select button, and the (-) decrease fan speed button. The lights will show us the fan we have selected and its speed by the brightness of the lights. 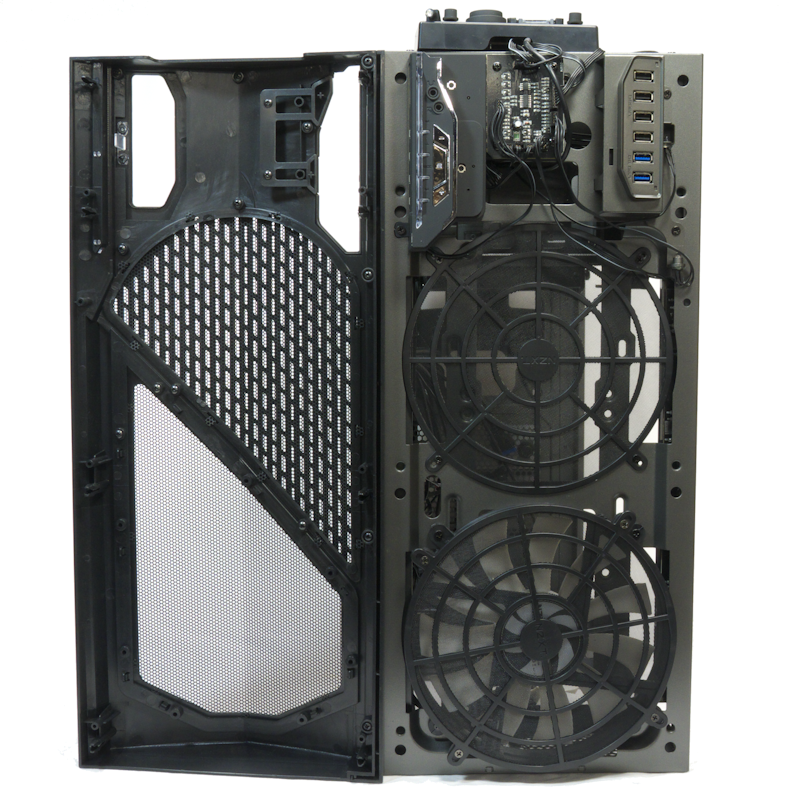 The right picture shows the labels: R for rear fans, IS for inside and side fans, T for top fans, and F for front fans. 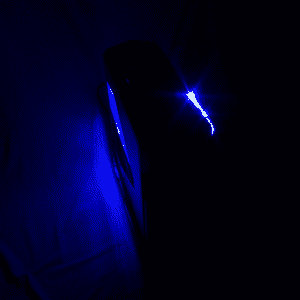 From the front, the fan controller’s light is chaste; simple. From the side we see it lit up. So, now we run the fans down until they stop. Then, with four hard drives in the upper cage we let one HD run by itself. The case is silent. After sixty minutes, we see the ambient temperature is 21 °C and the HD (reported by the HDD app) is 35 °C, for a temperature over ambient of 14 °C. Now we run the fans up to maximum and measure the noise. At 10 cm my SPL meter measures the front fan at 45 dBA, the top 46 dBA, the side 49 dBA and the rear 58 dBA (the SPL meter was catching the exhaust airflow on its wind sock). Measured from the inside, the rear fan is 47 dB at 10 cm. In theory this is the equivalent of 25 dB front, 26 dB top, 29 dB side, 27 dB from the inside, and 38 dB at the rear. It sounds a lot softer than that, and the rear noise is definitely a product of airflow interacting with the SPL meter. My ear tells me it is more like a 30 dB fan, which makes sense; it is a 27 dB fan. So the case is not quiet, but in every direction it makes mostly an air rushing sound. Now (drumroll) the temperature results; ambient 21 °C, HD 26 °C, or 5°C over ambient. That represents a nine-degree drop in temperature. So the cooling was effective. NZXT sells a 5.25-inch HUE RGB LED Controller that fits into a front slot of your rig. 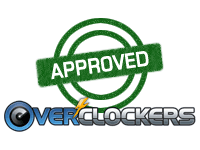 I previously reviewed it for Overclockers here. It is a very flexible controller, which allows you to adjust the brightness of each LED color separately. I was even able to get a deep purple with it. 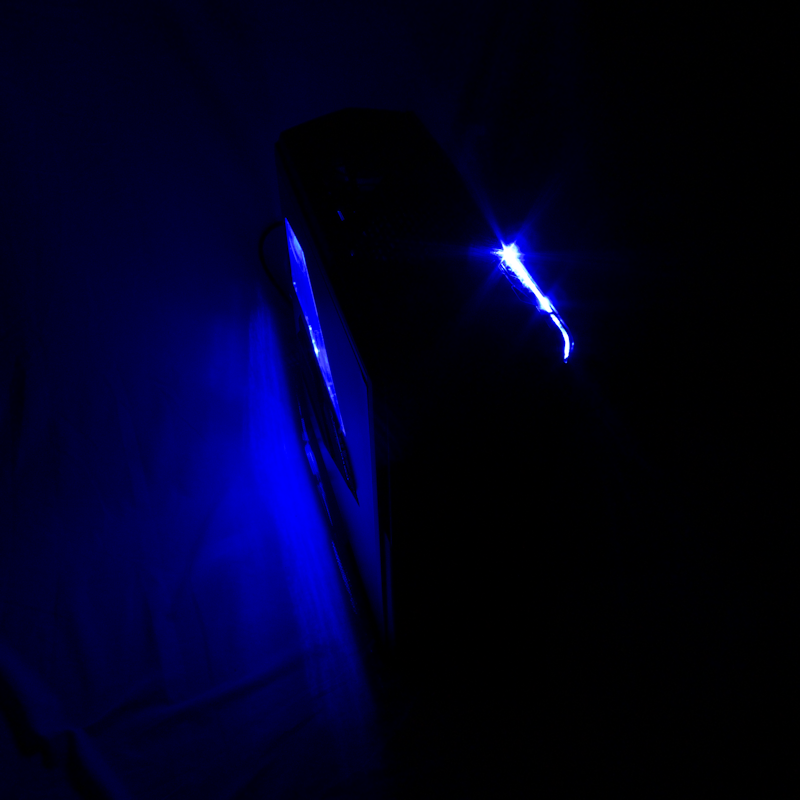 The HUE LED controller in the NZXT Phantom 820 differs somewhat from that unit. 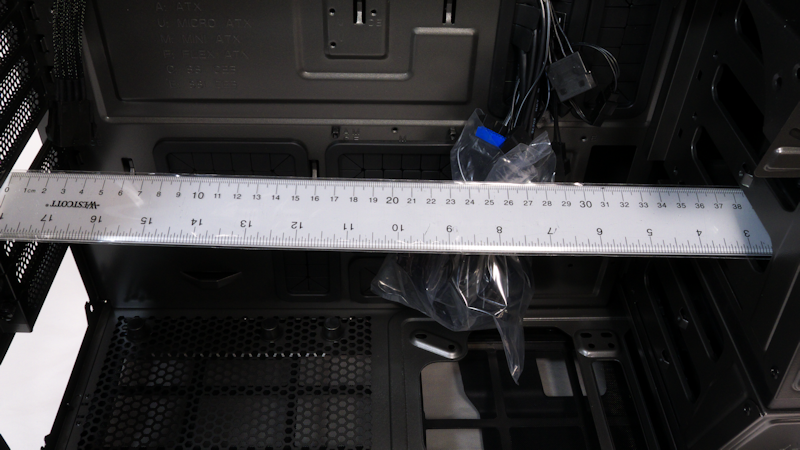 The controls are behind the case’s front door; above the 5.25-inch slot covers. 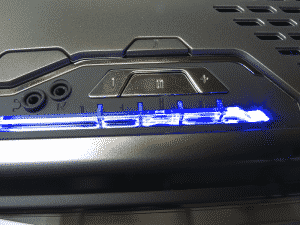 The LED Mode cycles you through off, side only, top only, top and side, then back to off. The color wheel is in the middle. On the right is the toggle button for the I/O LED’s. 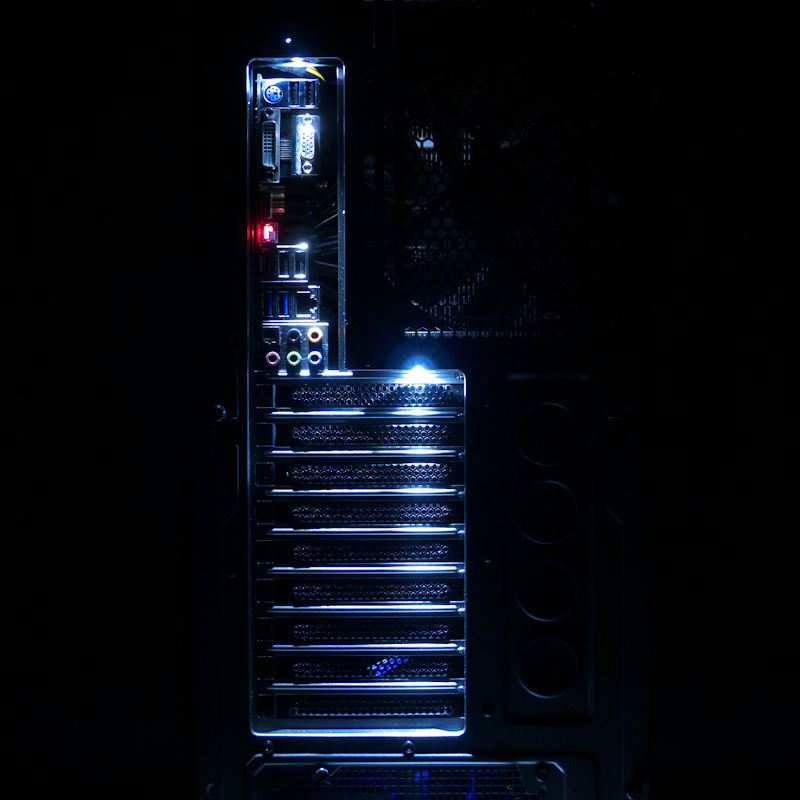 The I/O LED’s are a pair of white LEDs at the back of the case; one that shines down on the motherboard’s rear I/O panel, and one that shines down on the nine expansion slots. You turn them on and off with the I/O LED button. 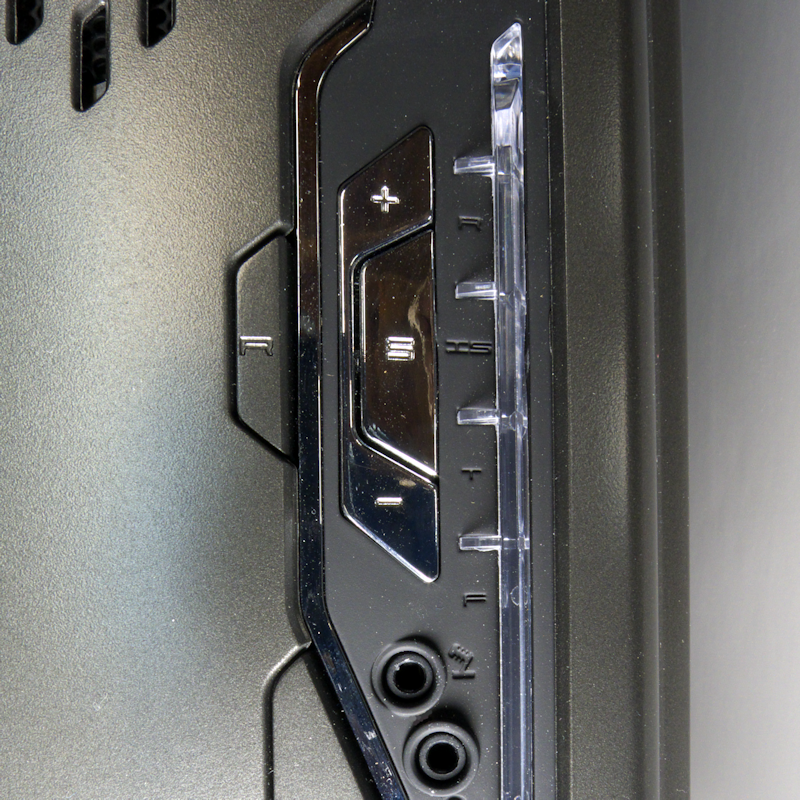 In the Phantom 820 you have a series of three LEDs sharing sockets inside your case. Unlike the freestanding HUE, there is only a single color wheel here. As you rotate this wheel you start at white, where all three LEDs are lit. From there you move to blue, green, and red before returning to white. You can get intermediate colors, too. 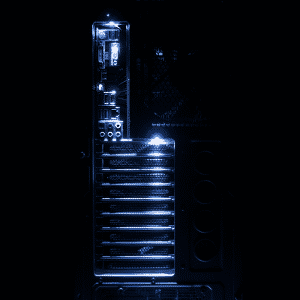 The NZXT website shows you a nice gold color, for example. If you press and hold the color wheel, all the LED’s come on and you have reset the controller to white. See below for some colors. The last picture shows the case from above, all lit up in the dark. Whew! This is one big case. And despite all the accommodations made for air coolers (top-down air intake, for example), one gets the impression this case was really designed for water coolers. 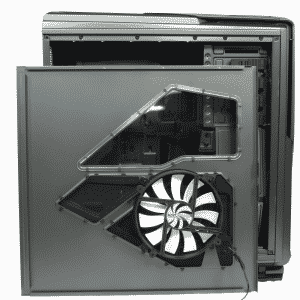 However, you can certainly put fans and radiators together in the Phantom 820 with room to spare. Let’s start with water. 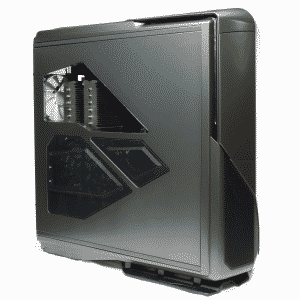 The designers at NZXT made sure that you can put their new Kraken X60 in this case. The X60 is the first All-In-One 280 mm radiator, and you can hang it from the top of the case. Actually, there are two places for 280 mm radiators, but the forward bottom position is a bit of a stretch for an All-In-One solution. 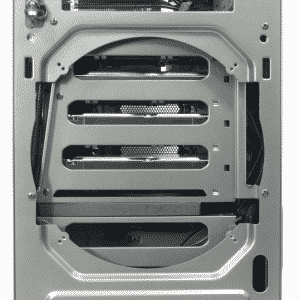 NZXT also lets you know you can put a 140 mm radiator where the rear exhaust fan is, and another 140 mm on their mid-case pivot. Everywhere you can put a 140 mm or 280 mm radiator, you can also put a 120 mm or 240 mm radiator. 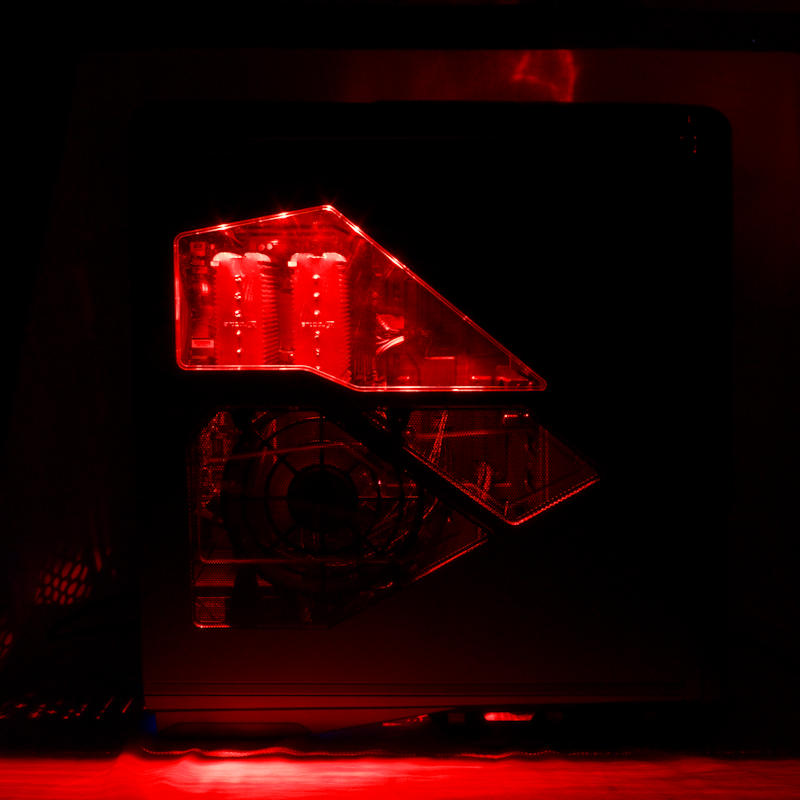 Which leads us back to the top, where NZXT made sure you have room for a 360 mm radiator, with 38 mm thick fans. As for fans, you get three 200 mm fans, with room for another. And the exhaust fan is 140 mm, which is quieter and pushes more air than a standard 120 mm fan. With all four stock fans running, the case sounds a lot quieter than it measures on the SPL meter. Unlike some cases, you could live with this one on your desk near your head. Not that you would have this case on your desk. It really is too big and heavy for that. The case feels sturdy, and it takes a fair amount of metal to do that. Overall, this is a well built case. All the edges fit together well. The parts all worked. The shelves the side panels rest on are a fine convenience, as are the latches at the rear of the case and the easy-fit open hinge at the front of each panel. Altogether they made getting in and out of this case brainless and painless. 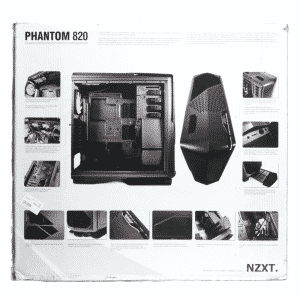 Inside, the NZXT Phantom 820 is mostly easy to work in and build your system. No show-stoppers, no problems getting your EPS12V plug to the motherboard. 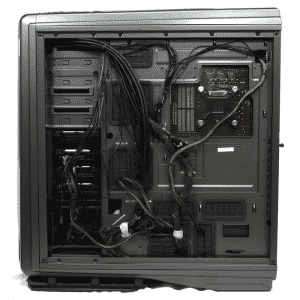 There are plenty of generously sized tie-down loops, and a generous amount of cable room behind the motherboard tray. The only pain in my drain was the recurring stubbornness of the hard drive trays. I had to fuss to get each HD properly bedded down. I’m of two minds on the HUE. On the one hand it does add prettiness to the case. On the other hand, the lighting system adds cost. On the gripping hand, most people who build in this case will want to show it off, and lighting can be a bother. This case comes to you ready to light up. I have the feeling NZXT knows their users. But if you see a non-HUE version showing up for less money, you will know that the experiment didn’t pan out. The current online price is $249.99 (€249.90, £199) at the time this is written. Comes with three 200 mm fans and a 140 mm exhaust fan. The built-in fan cools your hard drives adequately. 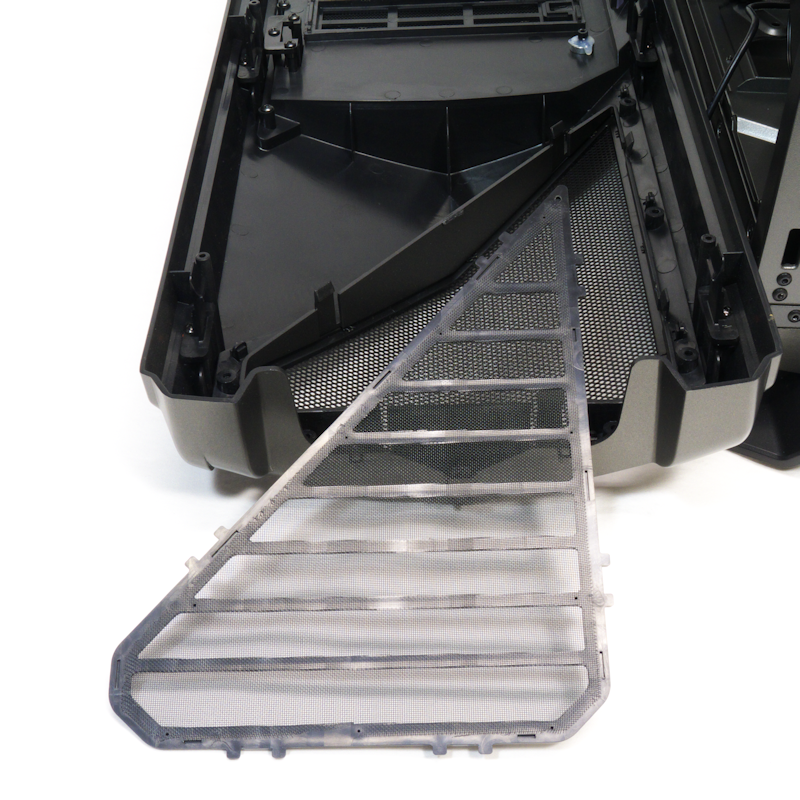 Most of the bottom filter set can be pulled out the front for easy cleaning. A built-in SD card reader. This makes a digital camera s-o-o-o easy to use. This is worth repeating: There are filters for two 200 mm top intake fans. 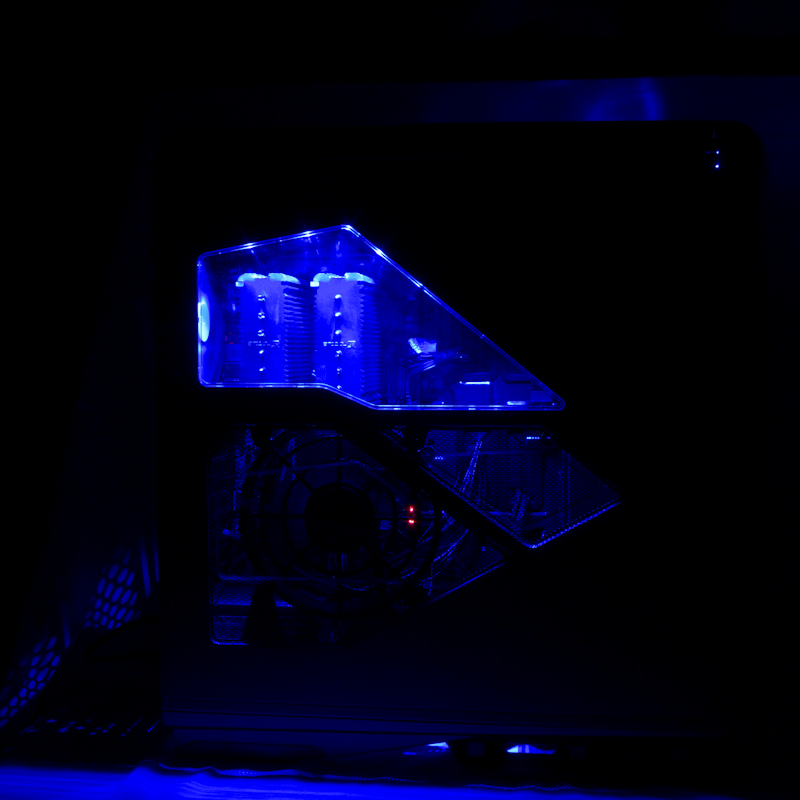 Give NZXT a Gold Star for this. Like all full tower cases, this case is big. Make sure you really want a big case before you get one this size. Part of the bottom filter set must be pulled out from the back, which means you must move this heavy case to remove and clean that filter. 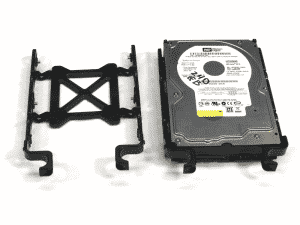 The metal rivets can make the hard drives difficult to install. They need a bit of a taper, or the whole thing needs to be re-thought. The side panel fan filter requires tools and time to remove and clean. The bottom filter should be a single piece that runs the length of the case and pulls out from the front. The pointy-tipped thumbscrews do not really make using them easier than plain thumbscrews. It would better to use thumbscrews that have a little bit of a guide on the tip. 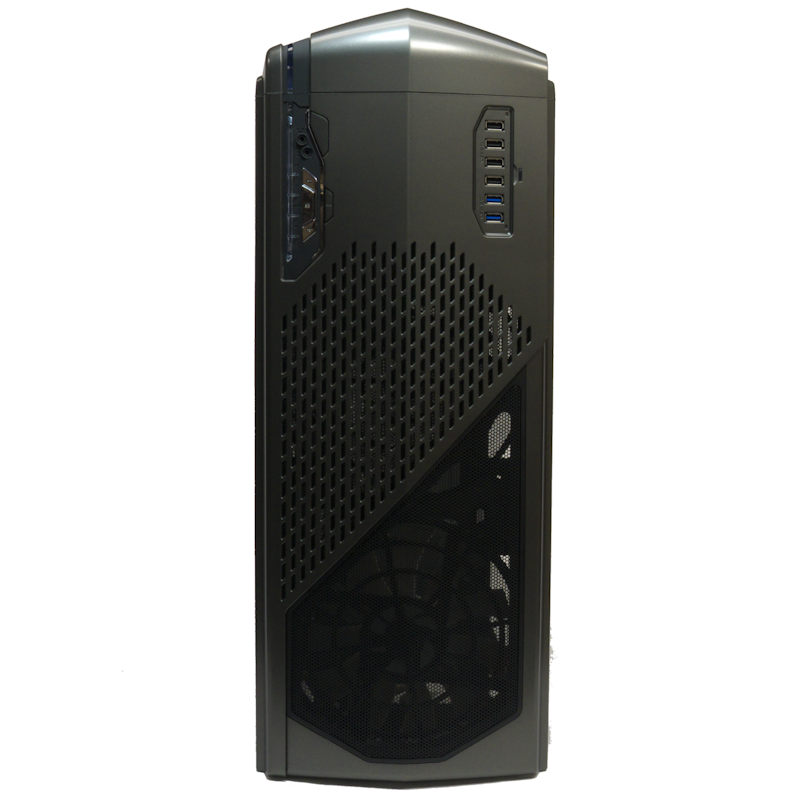 NZXT should post instructions about using Phantom 820’s HUE on their website. While you can explore the controls, you might miss something, and there are no HUE instructions included. Once again, banner pic got me. EDIT: Oh... and the feature that pic captures is... just... awesome. XNine, tell 'em they nailed it. its like the original phantom, on steroids. is it just me or are there fan filters on the exhaust? The filters on the top are there for when you decide to use the top fans as intake. This is an excellent provision by NZXT. It allows you to bring cool air to your heatsink, and not reuse the air that your motherboard and gpu's have already warmed up. I must say, that this review "seems" short, only because it's all hosted on one page, where usually most sites have multiple pages on a review. So, THANK YOU for using only one page. That's just a personal nitpick of mine is using more pages than anyone needs to, so, I welcome this. Additionally, this is a VERY in depth review, and I liked all the pics taken. Not enough reviews have taken these steps, especially removing the front fan filter, that was a really neat feature I think the designers made happen, whereas with the S810 you had to unscrew the filter, this one is just clamped in. Great job on the little details! Just received the 820! It's a beast. 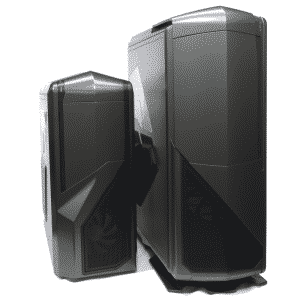 Moving my goods from my Corsair 600 SE sometime next week! Now I need to rearrange my computer room to make some space for it! Great review as well. Short, sweet and simple! That's how I like them!